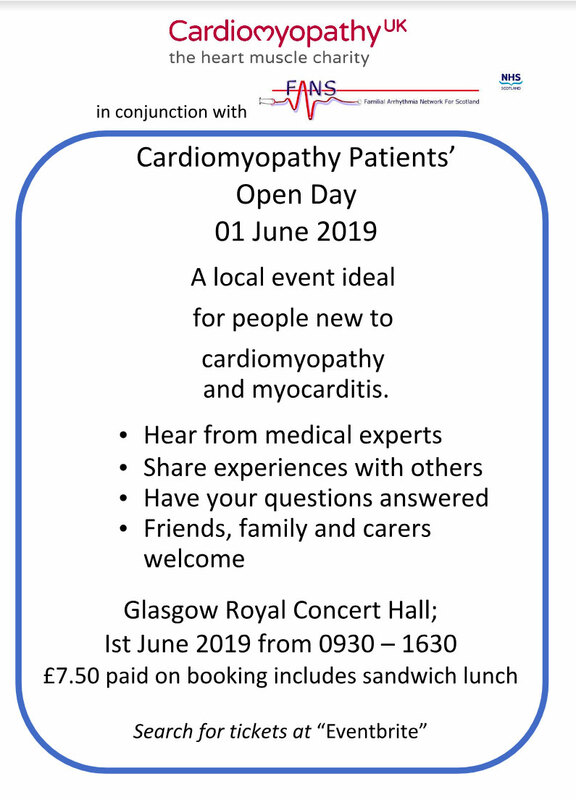 Cardiomyopathy UK has organised an Open Day to be held on 1st June 2019 at Glasgow Royal Concert Hall, with booking through “eventbrite”. Our recent experience in England has shown real value in gathering together patients newly diagnosed with a cardiomyopathy, and providing them with information about their condition, their treatment, and medications, and giving them a chance to explore the issues that their new diagnosis has raised. It is also an opportunity for CM UK to explain the services, resources and support that the Charity offers. Key to the success of this approach has been enlisting the help of cardiologists, clinic nurses and where appropriate ICC and heart failure nurses to publicise and promote the Open Day. To this end, the charity would like to provide fliers to be handed to new patients, and posters to be displayed in clinic waiting rooms. Probably most important though, is if one of the patient’s medical team has provided positive encouragement. I hope you don’t mind me approaching you to ask for your help in this regard. Feedback from patients and carers shows clearly that they have really appreciated previous Open Days in England, and we are keen to offer a similar level of service here in Scotland.